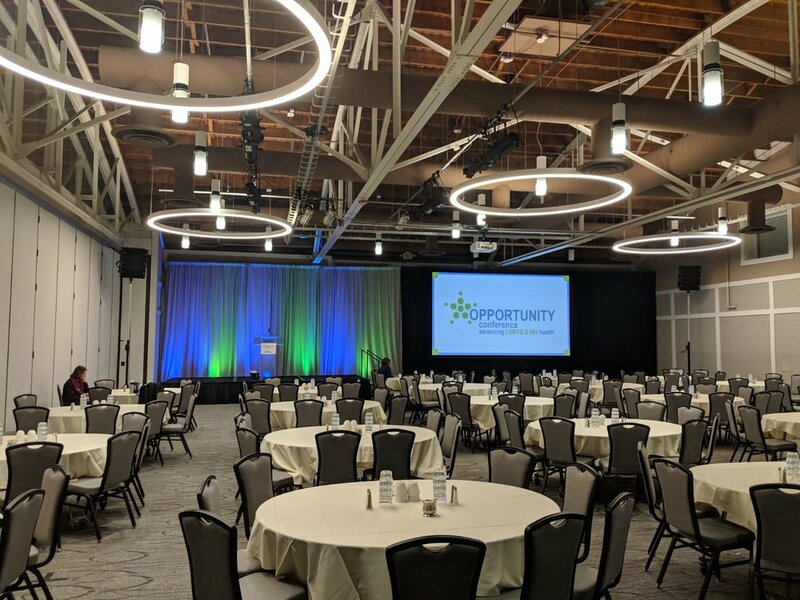 AV for You provided Audio, Video, Lighting and Staging Rental Equipment for JustUs Health’s Opportunity Conference at the Earle Brown Heritage Center in Brooklyn Center, MN. For video rental equipment we projected a Barco 12K Lumen HD Projector onto our Screen Works 16’ x 9’ Truss Screen. We also set up a Samsung 40” 4k Confidence Monitor at the stage for the presenters. 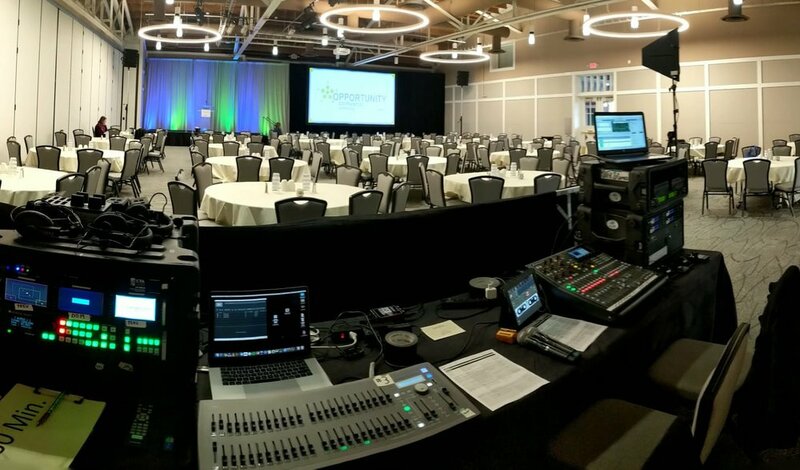 For audio rental equipment we set up dB Technologies DVA Line Array T4 Speakers on crank stands, Shure Wireless Lavalier Microphones and an Audio-Technica Gooseneck Microphone at the podium. For lighting rental equipment we set up eight Chauvet Ovation E-910FC LED Lights on truss towers for stage wash. We used twelve of our Eternal Lighting Cube Echo LED battery powered uplights to light up the backdrop. For staging rental equipment we set up ten panels of pipe and drape using both black and grey Rosebrand Drape for the backdrop. We also set our Frosted Podium on the stage. At the Tech table we used a Playback Pro Computer and Analog Way Saphyr Video Switcher to switch between powerpoint and video rolls. We utilized our HDMI/SDI Converter Kit to distribute HD Video Signal to the Projector. We set up our Shure QLXD4 Distro Wireless Mic rack, a Behringer X32 Producer and Behringer S16 Digital snake for reliable audio at the event. We controlled the stage wash using our ETC Smartfade 2496.